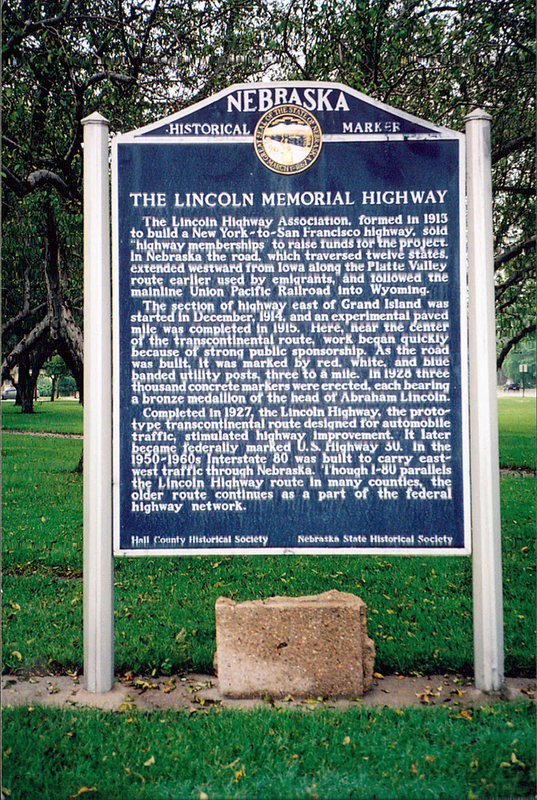 The Lincoln Highway Association, formed in 1913 to build a New York-to-San Francisco highway, sold "highway memberships" to raise funds for the project. In Nebraska the road, which traversed twelve states, extended westward from Iowa along the Platte Valley route earlier used by emigrants, and followed the mainline Union Pacific Railroad into Wyoming. The section of highway east of Grand Island was started in December, 1914, and an experimental paved mile was completed in 1915. Here, near the center of the transcontinental route, work began quickly because of strong public sponsorship. As the road was built, it was marked by red, white, and blue banded utility posts, three to a mile. In 1928 three thousand concrete markers were erected, each bearing a bronze medallion of the head of Abraham Lincoln. Completed in 1927, the Lincoln Highway, the prototype transcontinental route designed for automobile traffic, stimulated highway improvement. It later became federally marked U.S. Highway 30. In the 1950-1960s Interstate 80 was built to carry east-west traffic through Nebraska. Though I-80 parallels the Lincoln Highway route in many counties, the older route continues as a part of the federal highway network. “The Lincoln Memorial Highway,” Explore Nebraska History, accessed April 18, 2019, https://mynehistory.com/items/show/253.